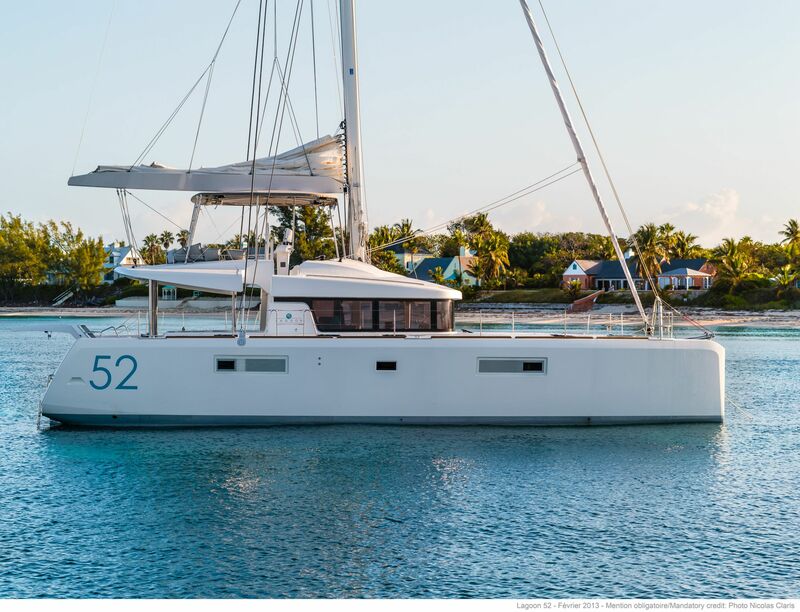 VALIUM 52 is a lovely Lagoon sailing catamaran, measuring 15.85m (52’) and launched in 2019. Her spacious layout and modern interior design were created by Nauta Design, accommodating up to 10 charter guests in 5 cabins. Guests are looked after by a professional crew of 3. A stairway leads from the water up each hull for easy access to the main deck aft, and a hydraulic swim platform ensures easy launch and retrieval of the tender. The shaded cockpit has a sofa/sunbed to port and a C-shaped sofa and table for alfresco dining to starboard. The foredeck has seating for guests to rest and take in the views, while up on the flybridge the helm controls are placed forward with plenty of plush seating for guests, and behind there is a large sunbed for sunbathing in the sunshine or shade. The port and starboard hulls contain the guest and crew accommodation, leaving the central section free for the forward helm station and port-side galley with sofa and raised table opposite for lounging and dining. The engines provide a top speed of 10 knots and a cruising speed of 9 knots. The accommodation sleeps a maximum of 10 guests across 5 en-suite cabins: 1 Master suite and 4 double cabins. ~ The master suite is placed to the port aft and can be accessed directly via the main deck aft cockpit. Inside, there is a double bed and the en-suite bathroom has his-and-hers sinks, a toilet and a shower. The starboard aft hull has a double cabin with access directly to the main deck aft. The en-suite bathroom provides a toilet, sink and shower. ~ Two more double cabins are located in the starboard hull, with the final double cabin situated forward in the port hull. ~ All have the same en-suite facilities. ~ The crew of 3 will provide stellar service throughout the cruise.